Xiaomi's Note series gained immense popularity in India after the launch of the Redmi Note 4 in January 2017. The company went on to ship over 5 million units of the Redmi Note 4 that year which was followed by the launch of the Redmi Note 5 and the Redmi Note 5 Pro in February 2018. Four months later, the company revealed that they had sold over 5 million units of the Note 5 series. Today, Xiaomi has unveiled the successor, the Redmi Note 6 Pro in India. The Redmi Note 6 Pro features a notch design on the front which has become a sought-after feature of smartphones in 2018. It is also Xiaomi's first phone to feature four cameras- two on the rear and two on the front. The company has also worked on the cameras which now use artificial intelligence based algorithms to determine scenes and improve the overall quality of the pictures. Rest of the specs, at least on paper, look eerily similar to that of the Redmi Note 5 Pro, including the aluminum build. Due to the adoption of the notch design, the Redmi Note 6 Pro features a bigger 6.26-inch full HD+ (2280 x 1080 pixels) display giving the phone an aspect ratio of 19:9. This is topped with a layer of an unspecified version of Gorilla Glass. Xiaomi Redmi Note 6 Pro runs on the same Qualcomm Snapdragon 636 chipset from last year which is paired with 4GB/6GB of RAM and 64GB internal storage. Users have the option to further increase the storage space on the Redmi Note 6 Pro via microSD card. Redmi Note 6 Pro runs on Android 8.1 Oreo-based MIUI 10 custom skin with added improvements like dynamic resource allocation and up to 30% faster app launch times. The dual cameras on the rear consist of a primary 12MP sensor coupled with a 5MP secondary sensor which assists in capturing depth information. The primary sensor has 1.4-micron pixels with a f/1.9 aperture. This combination, Xiaomi claims, allows the Redmi Note 6 Pro's cameras to capture more light and details of scenes. On the front, there's a dual camera setup which is a first for the Note series. The primary being a 20MP sensor and a secondary 2MP depth sensor. The 20MP snapper has a f/2.0 aperture while the second camera has a wider f/2.2 aperture. The cameras on the Note 6 Pro also get the scene detection feature courtesy of AI algorithms which also help in capturing portraits, beautify the selfies, studio lighting, dynamic bokeh effects among others. Of course, we'll have to see for ourselves how efficient these new camera features are. Redmi Note 6 Pro comes outfitted with a 4,000mAh battery which supports Quick Charge 3.0 but the adapter is sold separately. The battery capacity should, under optimal usage last for around two days with a single charge. The Redmi Note 6 Pro comes in two variants- 4GB RAM with 64GB storage and 6GB RAM with 64GB storage. The prices of these variants start at Rs 13,999 and Rs 15,999 respectively. Buyers can choose from four color options - Blue, Rose Gold, Red, and Black. Xiaomi is hosting a Black Friday sale on November 23 during which the Redmi Note 6 Pro will be available for Rs 12,999 and Rs 14,999. 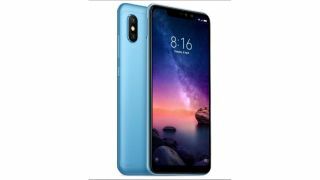 Xiaomi Redmi Note 6 Pro will also be available with offline retailers though a date has not been revealed by the company.